RESERVE YOUR VACATION NOW, AND GET $100 FOR GOLF, DINNER AT DUGGAN'S REEF, OR A SUNSET BOAT CRUISE! Special for High Season only - booked 60 days in advance. Come get away from it all at Palm Villa. Palm Villa is a beautiful, well maintained townhouse-style condominium located at The Reef in the exclusive East End of St Croix, USVI. This spacious recently remodeled 1450 sq ft. unit has two bedrooms, each with air conditioning, king size beds (as an option, one bedroom can be configured as two twin beds instead) and en suite baths, a large living room with flat panel television, a computer work station with internet access and WiFi throughout the unit, and a full kitchen. Enjoy breathtaking sea views of the lovely Caribbean Sea from all rooms. This unit has two great outdoor spaces. Enjoy the sweeping view of the Caribbean Sea or watch golf from the front patio, or a complimentary Cruzan rum cocktail at the Palm Villa tiki bar on the lanai, directly off the kitchen. Palm Villa is in the front row of condominiums so there is nothing to block your view. Palm Villa has all the amenities: New furnishings, WiFi, cable television, DVD player, ipod/MP3 player dock, telephone, gas grill, ceiling fans in all rooms, golf (at the easternmost golf course in the United States), pool, tennis courts, beach (directly across from the complex) and an award winning restaurant directly across from the compex. Go to the links and video section for the Palm Villa website and the Palm Villa video tour to see even more of this amazing condo. We know you will enjoy your stay at Palm Villa! Don't settle for second best, rent a newly furnished property with all the amenties, rent Palm Villa. My wife and I are from Western Massachusetts and the US Virgin Islands are like a second home to us. After visting many islands, the US Virgin Islands seemed like the best choice for us. No language barrier, US currency and best of all no passport required! After visiting St Croix only once, we fell in love with the island and knew we wanted to buy property there. After looking at properties all over the island, the area we liked by far was the East End. The East End is not overly built up like other islands such as St Thomas. What's nice is that you have the beauty and tranquility of the East End while only being a short distance from the casino or downtown Christiansted. It is like having the best of both worlds, having restaurants and entertainment close by but still having the natural beauty of the East End. The Reef complex was a natural choice for us. The complex is well maintained and the Reef staff and the other unit owners are truly wonderful people. We liked the Reef because it has it all: Pool, golf, tennis courts, beach and an award winning restaurant. Palm Villa has a sweeping view of the Caribbean Sea which you can see from every room and to sit on the front patio sipping a glass of wine while watching the ocean is a wonderful experience. Palm Villa is a little slice of paradise which we love to share with our guests. We have put a lot of effort in to making Palm Villa a beautiful place to stay, remodeled baths, new furniture and so much more. We hope you enjoy it as much as we do. Both baths completely renovated in 2012 with beautiful glass tiles and all new fixtures. The ocean and beach are just down the hill - 0.2 miles away! Condo on first level, so the view is unobstructed of the gold course and water! Amazing blue Caribbean waters! How many shades of blue can there be? DVD and Book Library available to all guests in the Reef office. Crib also available. Golf rate: $20, cart rental $15 pp, pull cart rental $2, golf club rental $5. My family and I spent a week at Palm Villa over Christmas. This was our first visit to St. Croix and we had a fabulous time exploring the beaches, eating wonderful food, and getting to know the island. Palm Villa was a great home base, allowing us to have leisurely mornings with coffee and breakfast outside, welcoming us back late in the day to wash and prepare for dinner, and giving us a comfortable place to rest and recharge. We really appreciated being able to use the beach towels, chairs and mats, and the convenience of having a home base with a washing machine and dryer, dishes, coffee maker and blender, and comfortable living area and beds. Although we did not stay there for the golfing, the course looked casual and fun. Having a rental car was key for us to enjoy the many beaches and ares of the island we visited, as well as a number of great restaurants. The "on-site" beach was very small but convenient, but we only ended up going there once, preferring to test out many of the other wonderful beaches and snorkeling places around the island. We LOVED our stay at Palm Villa! The property is gorgeous with absolutely stunning views. It felt like home from the day we walked in the door. Just enough space for my mom and I. The place was cozy but with plenty of room for the both of us. The agent was increadibly helpful, meeting us at the airport, and even sticking around late when there was an issue with our rental car. We arrived here exactly one year ago for our 25th wedding anniversary! We loved the lay out of the condo! Kitchen and living room together & right when you walk in to the right is the first large master suite! Go down a few stairs to the left to the kitchen & living room & then down a few more steps to the 2nd bedroom & out to the patio! We loved the views from all the windows. Yes some of the Windows openings are broken & that's because the openers are no longer available anywhere, we are on the lookout for them to send to the owner as we had these same Windows! It won't affect your view or stay! You will love this condo! It's relaxing, clean, and comfortable! The beach & restaurant is magnificent and the food is incredible get the lobster! No wonder so many Presidents of the US enjoyed eating there! The pool at the condo is also very nice! We were there during the drought so the grass was dry on the golf course however we loved this side of the island! We visited everywhere on the Island! Go to Christensted and do the buck Island adventure even if you don't snorkel!! Trust me you will love it!! Best part of our trip besides swimming with horses! When you get back to your condo and look out at the view of Buck Island from your bed, couch or patio you will love this condo Even more! Turn right from the condo & go to the most eastern point of the US! Lovely view & great picture spot! Go do the crab races! We made breakfast every morning & sat on the patio or in the kitchen. Everything you need to cook is there and a nice market not too far away from the condo has a great selection of foods including many gluten free items! Several restaurants on the island are up to par on food allergies! The beds are comfortable and the sheets were heavenly! I loved them so much looked at the tags & now have the same ones on my bed at home! The quilts are beautiful just like the pictures! We were blessed with a breezy climate & we only ran the air conditioners at night or early evening when we returned. Btw breezy conditions no mosquito bites not breezy & outside cover yourself up and spray yourself with deet! Your new Perfume!! Thankfully there was extras all over the condo and we left some too! If you forget anything check the condo before you buy anything! Lots of extras around the house. computer and guide books, soaps, shampoos etc. The manager is very helpful & the owners were flexible w/our dates! We cherished our stay here! Lisa, thank you for your wonderful review and we are glad you enjoyed your stay. Since your stay we have also replaced all of the windows in our unit so you will no longer have issues with the window handles. We look forward to having you again. The place is nice and the location is great. Worked well for our stay and the price is good... That said, the windows need to be upgraded and the air conditioning is only in the bedrooms. Overall I would recommend this location to the budget conscious, as it has a lot to offer for the price. Thank you for your review. Since your visit, we have replaced all of the windows in the condo which addresses the window issues you mentioned. We look forward to having you again. I found this villa in fantastic shape and very clean. The furniture was new and remodeled bathrooms and new flooring in the entire condo. It was great to sit out on the newly built deck and enjoy the beautiful weather. The pool is beautiful, quiet and relaxing. All the comforts of home were included. I would definitely book this condo again. There are attractions for everyone in St Croix. Beach Lovers, there are so many beautiful beaches that you can visit a different one every day and still not see them all. 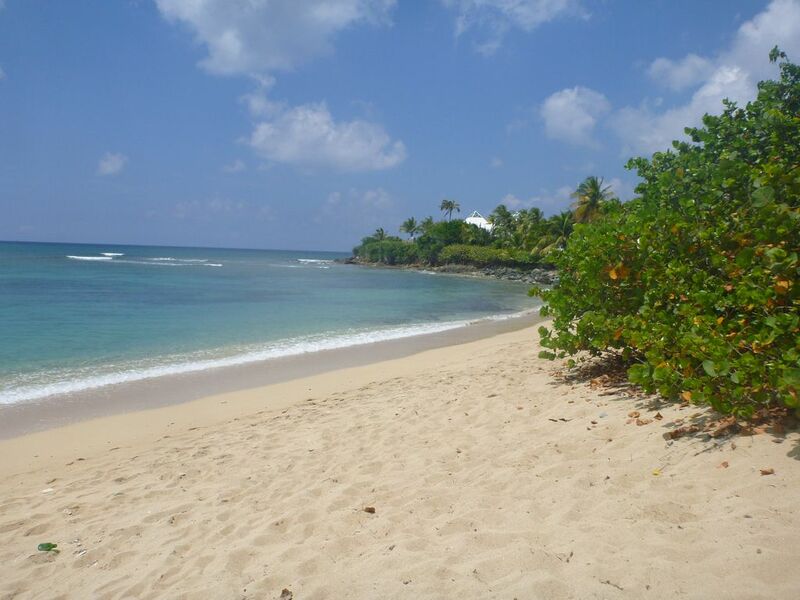 The Reef beach is right on site and many other beaches a short distance from the complex. Golfers, play the Reef course on site or visit the other courses across the island. Visit the easternmost point of the United States at the Point Udall National Monument. See the mocko jumbies (stilt dancers) and enjoy a traditional West Indian buffet at the nearby Divi Hotel. Enjoy gambling at the Divi Casino. Visit downtown Christiansted where you can shop, walk the boardwalk and enjoy a beer at the Fort Christian Brew Pub. Go to the rainforest on the North Shore and see the world famous beer drinking pigs at the Mt Pelier Domino Club. Visit the Cruzan Rum Factory, and Captain Morgan Rum Factory. Take a catamaran trip to the Buck Island National Monument. Take a Jeep tour and visit the Annally Bay Tide Pools. Sailing, Fishing, Scuba, Snorkeling, Jetskiing, Hiking and much much more await you in America's Paradise, St. Croix! 50% down payment is required to book your reservation with balance due 60 days prior to arrival. 10% Virgin Island Accommodation's Tax applies to all rentals. $350.00 Refundable Security Deposit is required on all rentals.